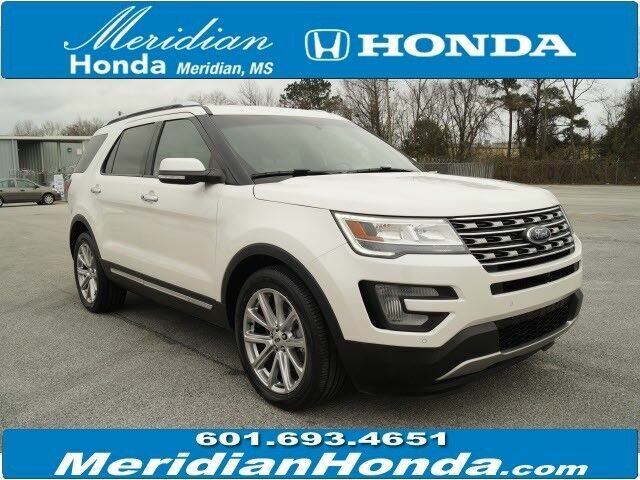 * 6 Cylinder engine * * 2017 ** Ford * * Explorer * * Limited * Don't miss out on this 2017 Ford Explorer Limited! It comes with a backup sensor, push button start, remote starter, parking assistance, a navigation system, braking assist, dual climate control, hill start assist, stability control, and traction control for an even better ride. It comes with a 6 Cylinder engine. With a stunning white exterior and a beige interior, this vehicle is a top pick. You can trust this SUV because it has a crash test rating of 5 out of 5 stars! Make your move before it's too late schedule a test drive today! Meridian Honda the best cars... The Best Experience. Your hometown Honda dealer servicing Meridian, Forest, Jackson, Birmingham, Philadelphia and Hattiesburg.